That includes building partnerships with the wider community on sustainability issues and using U of T building projects as “living labs” to try out new sustainable technologies and practices. The committee is also working on a plan to allow every U of T student, regardless of their program, to add a sustainability component to their studies. “Everything we do has a sustainability dimension, so let’s treat it that way and add students and faculty into the equation,” says John Robinson, the committee’s chair and the president’s adviser on environment, climate change and sustainability. Created in early 2017, the presidential committee was tasked with finding ways to advance U of T’s contributions to meet the challenges of climate change and sustainability, with a particular focus on research and innovation, teaching and university operations. The committee’s work grew out of U of T President Meric Gertler’s 2016 report “Beyond Divestment: Taking Decisive Action on Climate Change”. It comes amid a series of stark warnings from scientists about the potentially dire consequences of global warming, including a report this month by the U.S. government that found climate change is costing the United States hundreds of billions of dollars and creating health risks. “The University of Toronto’s most valuable and effective contribution to addressing climate change emerges from translating innovative research into concrete actions and solutions,” President Gertler says. While the committee’s members spent much of the last year gathering information and hashing out ideas, Robinson says the group is now preparing to hire staff and move into the implementation phase of its work. When it comes to using U of T as a living lab, the committee has identified six projects – one new building and one retrofit on each campus – that it believes are suitable for providing students and faculty opportunities to “engage with operational sustainability activities.” They include: a 14-storey academic tower built out of timber above U of T’s Goldring Centre for High Performance Sport, and a retrofit project at the University of Mississauga’s Recreation, Athletics and Wellness Centre. “The next step is to develop a proposal for each of those projects, and meet with the people in charge so we can negotiate a way to engage students,” says Robinson, who is also a professor at U of T’s Munk School for Global Affairs & Public Policy. Key to the plan’s success is finding a way to involve students without putting project budgets or timelines at risk. Among the ideas: allowing students to observe U of T’s project study, planning and implementation processes; sharing technical documents and project information so students can participate in “shadow” design exercises; and having students participate in project monitoring and performance assessments. Robinson has considerable experience with such partnerships on a smaller scale. 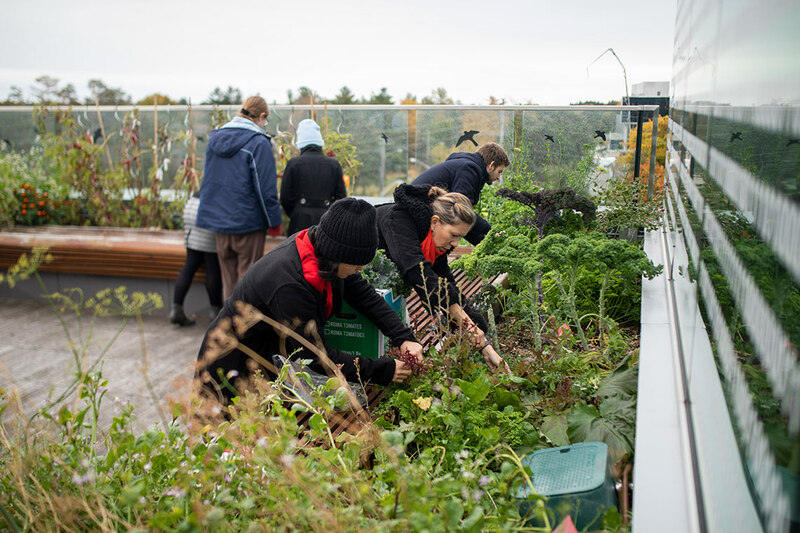 His “U of T as a Living Lab of Sustainability” course connects undergraduate and graduate students with sustainability projects undertaken by university staff. Projects have ranged from a study of the impact of new signage on recycling behaviour to one on the potential for a rooftop garden at Trinity College. As for curriculum changes, Robinson says the committee completed an audit of about 8,000 undergraduate courses and discovered a quarter currently include sustainability content. Now, the committee is in the process of developing curriculum “pathways” for sustainability-minded students to pursue at U of T’s Faculty of Arts & Science, the John H. Daniels Faculty of Architecture, Landscape, and Design, U of T Mississauga and U of T Scarborough. The committee has also conducted a similar review of U of T’s community engagement practices. Robinson says it found three main partnership models at the university – innovation-focused private sector partnerships, policy-focused partnerships with government agencies and socially oriented partnerships with civil society groups. The plan is to build upon these existing models as U of T expands further into the sustainability space. The annual report, for example, notes U of T is regularly approached by potential corporate partners who want to test new technologies such as energy-saving software. “Such opportunities not only offer excellent opportunities for student engagement, but also represent potential sources of funding for students from the companies that will benefit from collaborating with U of T,” the report says. Change won’t happen overnight. Robinson says simply getting a handle on current sustainability offerings has been a challenge at a large, de-centralized institution like U of T. The flipside, he says, is that once the right “champions” are identified, there’s considerable opportunity for U of T – one of the top ten public institutions in the world – to make a significant impact.